At school, your child is learning from and interacting with older classmates. Peers share knowledge as well as give a point of reference to what lessons are coming next and how the information being taught ties into the bigger picture. When your child is at home, you are the teacher. Don’t expect your child to automatically know how to do something. Demonstrate how a task is done and explain why it needs to be accomplished. Giving your child the ability to observe will show how specific tasks tie into other responsibilities. This promotes your child’s independence. Not all children learn at the same pace or have the same talents. Take the time to observe your child. See what methods he or she learns from best and at what pace he or she learns. When you see joy and success in a method your child is using, encourage him to continue learning by that method. Observing your child and following their lead enhances the natural skills and enthusiasm your child possesses rather than conforming him to a traditional standard of learning others may think is best. Order not only offers a focused environment for the home, but also encourages your child to accomplish tasks himself. By giving items a predetermined location, your child will know exactly how and where to put something away and will be encourage to do so without prompting. Order also keeps your child focused on one task at a time. 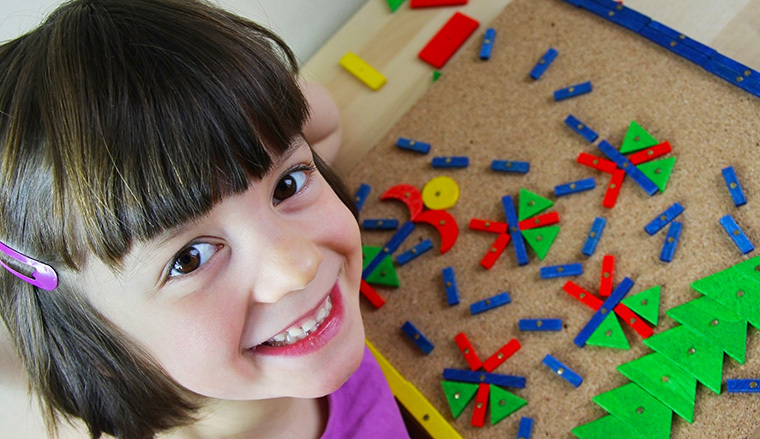 Having only one activity with no mess or additional undertakings distracting your child promotes focus. Children learn best when they can focus on a single task. Encourage your child to interact with his or her surroundings by keeping objects on their particular level. Place open shelves low to the ground where your child has easy access to learning materials as well as the ability to simply put them away when finished. Additionally, it is important to keep lessons or activities on the intellectual level of your child. Provide your child with learning activities and chores matching his or her current developmental level. Don’t jump ahead of your child’s intellectual level. Children are self-promoters and feel excitement to continue learning when they have a sense of accomplishment. While we want to challenge our children, remember to move forward at a developmentally appropriate pace. Trying to move ahead too early may discourage your child. Independence is a key component to the Montessori method, so any chores or materials readily accessible to your child should be kid-friendly. Replace any glass or breakable items with more durable materials. Put your kid-friendly materials in cupboards close to the ground for accessibility. The same goes for chores. Start with an activity that does not require constant supervision. For example, start your child washing potatoes for dinner, and as the learning expands, have them begin to peel and eventually chop the potatoes. Following this type of example will give them the liberty to explore and grow on their own. Encourage your child to explore concepts inside and outside of the home. Activity is a great promoter of knowledge and learning, and movement helps promote awareness. Chores are also a great way to inspire your child’s self-sufficiency. They can give your child a sense of pride in their work, which only enhances an enthusiasm for learning. Chores and activities also stimulate learning through all five of your child’s senses, as opposed to simply learning from behind a desk. Encouragement, freedom, and independence are some of the most important concepts to bring home. Providing your child with the freedom to learn, grow, and explore will fuel a sense of self-accomplishment. For a child, there is no greater reward than learning. By incorporating these methods, your child will feel the security and care they need to thrive.